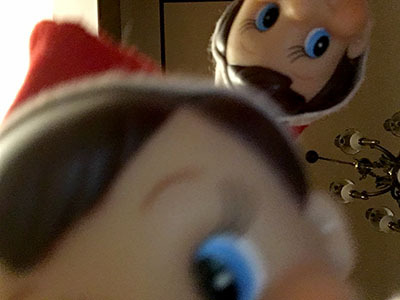 So, what have your elves been up to since they popped back from the North Pole to keep a watch on your children and wreak a little havoc in your household? My children's little buddies — Fred and Jingles, above — have been pretty busy, from filling my iPhone with late-night selfies to making themselves hot cocoa (and a mess) with our Keurig machine. Most memorable to my son and daughter was the time they hung our (clean) underwear all over the Christmas tree. Early this morning before the kids awoke, all our elves apparently needed for inspiration was meteorologist Christie Dutton saying "possibility of flurries" on the morning news (see below). If you think your elves' ideas are waning as we get closer to Christmas, take a look here at what some other silly elves have been up to. What's your family's most memorable Elf antic? April Allman is a graphic designer for Today's Family magazine.